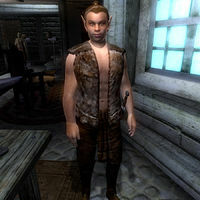 Enilroth is a Bosmer smith, and apprentice to Varel Morvayn at his shop Morvayn's Peacemakers in Anvil. During the Dark Brotherhood quest Following a Lead, Enilroth acts as the unknowing courier of the Dead Drop Orders written by the robed man residing in the basement underneath the Lighthouse. He has an early start, waking up at 6am and immediately heading to The Flowing Bowl for a two-hour breakfast. He then works an eight hour shift as Morvayn's apprentice, before meeting up with his secret lover, Heinrich Oaken-Hull's wife Hasathil, behind the Horse Whisperer Stables, conversing with her until 8pm, at which time he will head back to The Flowing Bowl for a two-hour dinner. He then returns back to the shop, wandering around for two hours before he settles down for the night at 12am. Enilroth wears a huntsman vest with matching pants and moccasins. He wields a steel bow and a steel dagger. He carries the key to the store he works in and a small sum of gold. During the related quest, while acting as a courier for Mathieu Bellamont, the Dead Drop Orders 8 and your 500 gold reward will be added to his inventory; after being caught, Enilroth will keep the gold reward for himself, leaving only the Orders in the barrel. When you meet him for the very first time, he will politely introduce himself: "Enilroth, Morvayn's apprentice." When asked about the city of Anvil, he will tell you: "Varel Morvay's [sic] been a good master. I like the town and the people. No reason why I wouldn't want to be here for many years... just like the master." His master concurs and will tell you: "Been here thirty years, and I expect I'll last another ten or so. When I'm gone, gods willing, my apprentice, Enilroth, will tend the smithy." "It's just outside the city walls. I think the robed man has lived there for quite some time. In... in the cellar." "No, please! The lighthouse! Just outside the city walls! I think the robed man lives there! In... in the cellar!" "The lighthouse is... is just outside the city walls. I think the robed man has lived there for quite some time. In... in the cellar." He will then continue: "I don't know what goes on down there, but there's a horrible smell coming from underneath that door. It's like... something died inside! Listen, that's all I know, really! Maybe Ulfgar Fog-Eye can tell you more. He's the lighthouse keeper, and probably rented out the cellar. Talk... talk to Ulfgar. He's sure to have the key to the cellar. You know, if... if you want to get down there! Now please, just let me go!" On subsequent meetings, until the quest is completed, a seemingly guilt-ridden Enilroth will say: "I hope you're not too angry with me. I... I never meant to do anything wrong, honest!" There is a minor error in the subtitle for his line of dialogue about Anvil: it misses the "n" from Varel Morvayn's name. Technically, Enilroth provides repair services and is a merchant who will buy Weapons, Armor, and Miscellaneous Items. However, his AI schedule does not include any times during which he offers services. Therefore, it is impossible to ever use him as a merchant or repair person. Also, because the game recognizes Enilroth as a merchant, when your Mercantile skill is high enough to invest in a shop, the option to invest 500 gold will appear in his dialogue selections. It is a waste of money, though, as Enilroth cannot buy or sell items. Esta página foi modificada pela última vez à(s) 07h34min de 4 de janeiro de 2016.